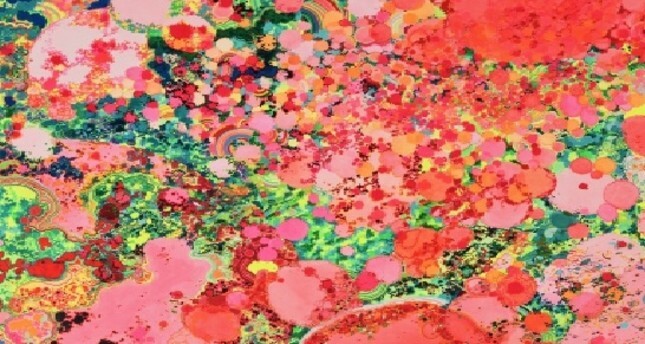 Zhou Fan, “Phobia,” 2018, mixed media on paper, 150x300 cm. Pera Museum greets the spring season with the new exhibition "Out of Ink: Interpretations from Chinese Contemporary Art," which opened last week and is set to run until July 28. Curated by Karen Smith, the works in the exhibition do not necessarily rely upon conventional materials like ink, paper or brush, but encapsulate the cultural spirit of ink. It echoes content familiarly seen in ink paintings, such as landscapes or natural forms, as single or juxtaposed elements from the natural world, as well as the role of calligraphy. None of the participating artists claim to be ink artists. Instead, they work with, appropriate, manipulate, or deconstruct the spiritual and aesthetic ethos of "ink" as cultural metaphor, philosophical system and as understanding of the relationship between man and the physical world of form and space. In their respective ways, each artist makes a contribution to the future possibilities of a medium that has been the dynamic pulse of the nation's culture through China's long civilization. The exhibition presents the works of Chen Guangwu, Chen Haiyan, Li Ming, Liang Wei, Luo Yongjin, Qiu Anxiong, Sun Yanchu, Tang Bohua, Xu Bing, Xu Hongming, Xing Danwen, Jian-Jun Zhang and Zhou Fan. Jian-Jun Zhang, "Qianzi Wen," 2017. The exhibition catalog of "Out of Ink: Interpretations from Chinese Contemporary Art" includes essays by curator Karen Smith and Beth Mckillop, senior research fellow at Victoria and Albert Museum. The curator explains in her article that the exhibition was approached with the premise that, in their various interventions and the processes that they deploy, the artists are enriching and extending the possibilities of the ink tradition for audiences today. According to Smith, in the long term, such extension feels necessary if the art form is to retain its relevance in the future as an indices of cultural identity for Chinese society. Contemporary art in China gained momentum in the 1980s. The art scene that emerged at that time is variously termed as new wave, avant-garde or simply new art. The artists' aim is to learn, absorb, digest and assimilate all that had been and that was being done in the name of art in the West and to do it better, bigger and smarter. Through the 1980s, the approach taken to working with "ink," as painting and as a bold calligraphic experiment, was no less avant-garde than the embrace of conceptual ideas from the 20th century Western artists. In the 1990's we find examples like abstract ink artist Liu Zijian, whose work enjoyed little attraction within the local contemporary art scene, or among critics and curators of the time. Some of the most interesting work in the field of ink was done by a first generation of artists born in the 1950s like Gu Wenda, Yu Youhan, Yang Jiechang, Wang Gongyi and Jian-Jun Zhang, etc., and was markedly ground-breaking in its use of characters, scale, mark and materials. Many artists left China to settle abroad and subsequently worked in a variety of more conceptual ways. Around 2006 with the advent of an art market but especially due to China's changing government policies, which resulted in China's accession to the World Trade Organization in 2001, a space for art, for the contemporary, within the sphere of public life across the nation had been created. 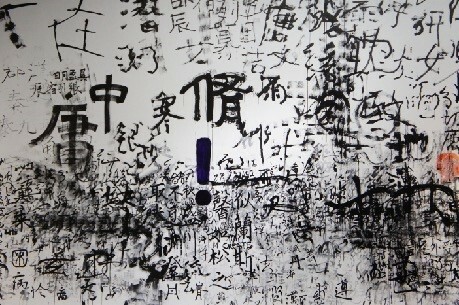 As part of "Out of Ink: Interpretations from Chinese Contemporary Art," artist Xu Bing will give a talk today at 6:30 p.m. Academic and curator Beth Mckillop will give a talk on April 26 at 6:30 p.m., in which she will provide a historical context for exploring the work of 21st century artists on display in the exhibition.